Bouse has what residents call a "unique flavor". The historical link between Mining and the Bouse area is unquestionable. Then the region was to become a official secret as the location for the Top Secret location of Camp Bouse for the Army during the early 1940's while the rest of the world was dealing with WWII.In total contrast to the top secret base was the nearby Japanese Internment Camp of Poston. The unincorporated community of Bouse is located on Highway 72 in west-central Arizona, 29 miles from the Arizona and California border. Originally known as Brayton, Bouse as it is called today started as a mining community of tents when prospectors started arriving in the 1860's. The biggest draw was the availability of copper and gold. In 1964, the Old Planet mine on the Bill Williams River 20 miles north of Bouse was considered the first rich copper mine in the US. Quartzsite 27 miles from Bouse was at one time the richest placer gold mine in the country. Thomas Bouse, who arrived in the region from Missouri around 1889, owned several mines --- the most prominent being the Old Dutchman mine and homesteaded on 320 acres in the Dry Ranegras plain. Thomas decided to make some fast money selling his well, the railroad right of way and some mining claims. In 1904, the Arizona & California railroad, a branch of Sante Fe, laid tracks from Wickenburg, Arizona to California, passing through present day Salome, Hope and Bouse. The railroad did not reach Parker until about 1907. Eager small-time businessmen came to setup businesses to serve the railroad workers and miners who began to arrive in great numbers. 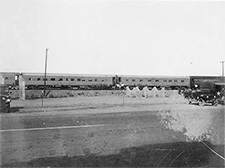 By 1906, John Brayton, owner of the Brayton Commercial Company of Wickenburg and Salome, had established the Brayton Mercantile Company on the Eastern side of the train depot and railroad tracks. The growing community became known as Brayton. With the railroad came other businesses in more permanent structures and on May 19, 1906 the Brayton Post Office, in then Yuma County was established. When the application form was submitted the proposed name on the document was Brayton. The form was returned by the government with Brayton crossed out and Bouse written in red ink. The Post Office was officially changed to Bouse on January 22, 1907. By late 1910s, Bouse consisted of many wood framed buildings and small concrete block buildings housing businesses including hotels, gas stations, saloons, restaurants, mercantile shops, auto repair, a school house, post office and other operations that supported the growing community. But by 1930 both the Swansea and the Planet mineshad closed and Bouse had become a sleepy village of miners mixed with a few agriculture and cattle farms. By 1943, many of the businesses had closed, and many of the remaining buildings were in poor condition. Bouse, with the world at war became known again, but only to those bought there by General George C Patton. General Patton brought World War II troops to Bouse for secret desert training. Camp Bouse was so extremely top secret, it was not listed with the dozen other training camps. They tested a top secret weapon system mounted on top a tank turret known as the 'Gizmo'. To this day, historian/authors often miss Camp Bouse when writing about the desert traing camp. Troop movement was extremely restricted -- once in Camp Bouse, there was no chance of transferring out. Camp Bouse was closed in April 1944 and all the men were shipped back to Fort Knox, Kentucky then to Kilmer, New Jersey and onto England for further Training. Each year Bouse celebrates Camp Bouse Days with some of the men stationed in Camp Bouse returning. As with much of the region, in the 1960s as the RV business grew and small trailers gave way to larger motor homes, the local population grows over the winter months as retirees and travellers leave the cold northern winters to enjoy more pleasant temperatures holidaying in and around the Bouse region and indeed throughout La Paz County. Highway 72 is a busy roadway and the main business route between Phoenix and Las Vegas. During the winter season it is packed with big trucks and RVs but in the summer RVs are replaced by cars pulling boats and other water craft to the river. extract from " Bouse Arizona - Then & Now"